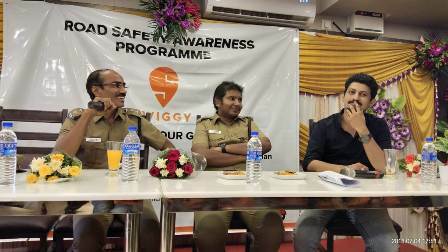 Chennai: Swiggy, India’s largest food ordering and delivery platform has partnered with the RTO department in the North zone to launch a Road Safety Program for its delivery partners. On Wednesday, over 100 of Swiggy’s delivery partners who service areas including Porur, Poonamalle, Vadapalani, KK Nagar, Iyyapanthangal participated in an hour-long awareness session led by officials from the RTO and the Swiggy team. The drive was conducted with the objective of increasing awareness, skills and knowledge amongst the riders. It also focused on sharing best-practices to ensure a safer riding experience for Swiggy delivery partners, especially during peak hours. The program saw Mr. Sampath Kumar (Regional Transport Officer - Poonamallee), Mr. Radhakrishnan (ACP – Traffic - Poonamallee) and Mr. Kumara & Mr. Karthik (Motor Vehicles Inspector) from the RTO department, as well as Senior Swiggy officials in attendance. In the coming weeks, Swiggy plans to work with the RTO to conduct such drives for its delivery partners across Chennai.